European corn borer (ECB) adults are being captured with more frequency in the northern half of the state now, but overall, catches are low. Highest activity is now found in Cumberland and Morris counties with local hotspots elsewhere (see ECB map). The earliest sweet corn plantings are now the right size to support ECB larval infestations. Scouts have not reported seeing adults flying in plantings (a phenomenon that usually precedes larval infestations). However, within the next week or so we should begin to see feeding in the most advanced plantings. Be sure to begin monitoring the earliest plantings for ECB feeding while they are still in the whorl stage. Consider treating when the number of infested plants in a 50 plant sample exceeds 12%. Feeding in the whorl stage will appear as numerous small holes (called “shot-hole”) on leaves, with damage present on consecutively younger leaves. Insecticides that are acceptable in organic production include the spinosyn based material Entrust (IRAC-5) and Dipel (IRAC-11a). The 10G formulation of Dipel is particularly useful when granules can be dropped or broadcast such that they get into the whorls of corn plants. See the 2016 Commercial Vegetable Recommendations Guide for more insecticide choices. A few corn earworm (CEW) moths were captured in the southern counties this week. These individuals do not represent of a threat to sweet corn at this time. We will continue to monitor CEW catches and present maps and spray recommendations as moth numbers and crop stage warrant. Seven pepper weevils were caught on the southeast side of the Hammonton this past week. Growers in the area need to remain vigilant regarding possible infestations. 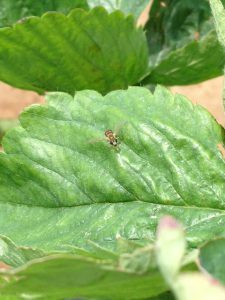 Insecticide applications are recommended at the first bloom for nearby fields to prevent the possible early infestation by weevils. Refer to the Commercial Production Recommendations Guide for a list of materials for killing adult weevils. Several brown marmorated stink bug (BMSB) adults have been captured over the past week. As numbers increase, population maps of this potential pest will appear in this publication, along with scouting information and control tactics. 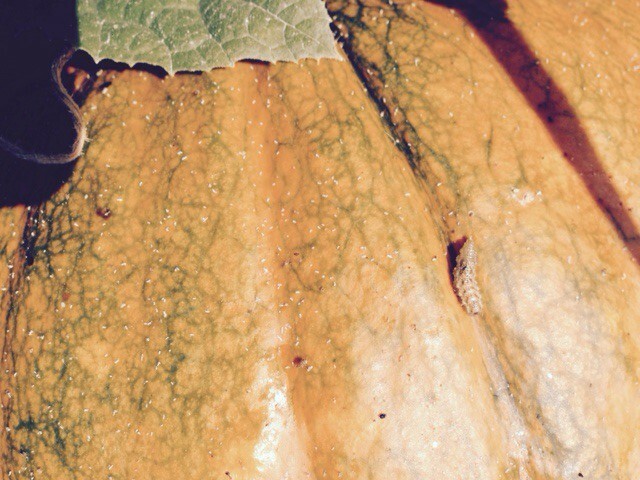 Syrphid maggot on pumpkin fruit. A number of newly transplanted fields have readily apparent aphid infestations. It is likely that these infestations first occurred in the greenhouse prior to transplanting. IPM personnel have been monitoring these infestations, and have begun to notice increasing presence of aphid predators (primarily syrphid flies their larval stage (maggots) – see photos) and evidence of parasitism by Aphidius wasps. Prior to the development of fruit on plants, it is possible to monitor aphid populations without applying an insecticide. In many cases, predators and parasites will reduce aphid populations to very low levels prior to fruit enlargement. If a broad spectrum insecticide is applied for aphids, it will generally make the situation worse. Appropriate insecticides may be found in the 2016 Commercial Vegetable Production Guide.